If puns are your go-to thing with your dad or you have a more relaxed type of patriarch, wish him a happy Father’s Day with puns and fun thank-you cards. Puns adds an endearing touch, not to mention that it brings out the inner humor in you and giggles out from your father. To give you an idea, scroll below to view our collection of punny thank-you cards in celebration of Father’s Day. 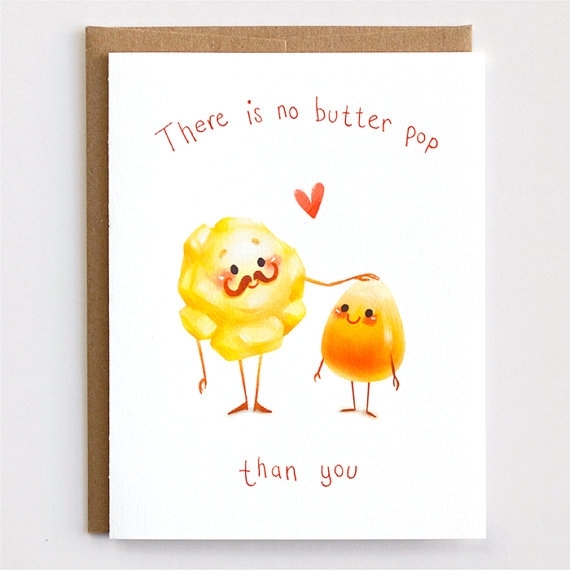 These thank-you cards are illustrated with adorable characters mixed with clever puns. You may also check out our list of thank-you cards you can use beyond Father’s Day celebration. We’re eternally grapefruit, I mean grateful, to our dads. But like the sample above, autocorrect does a bit of perishing to the recipient, sometimes leading to misunderstandings. In this case, it is cute to use autocorrect for a punny thank-you card. So go ahead, have fun and use this timely thank-you card to get a giggle from your dad. Dads are notorious for blowing out intestinal gases and sometimes, the most powerful ones are unannounced! But we love them anyway. 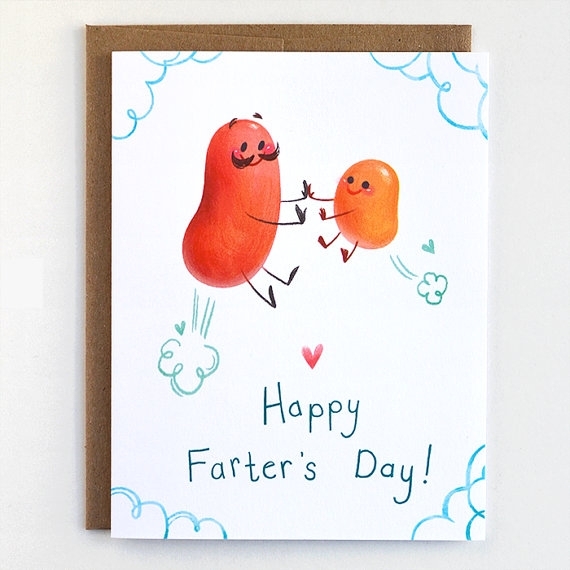 Turn your father’s gas emissions into an adorable illustration of beans farting. I mean why not? Eating beans makes you emit gas out of your body. This illustration is cute enough not to use and clever with the pen and concept. If you share a love for science or archaeology with your father, why not use this roar-some dinosaur thank-you card as a Father’s Day gift? This card is designed in a landscape layout, different from the standard portrait format. This is a clever design with the pun and the complement use of the colors yellow and violet. This is one great way to say thanks to dad for the the way he raised you and pulling out the humor in you. Parents may have a hard time transitioning from the older generation of mobile to today’s smartphones. They might incur difficulty while using phones. The common one is the autocorrect feature in text typing. 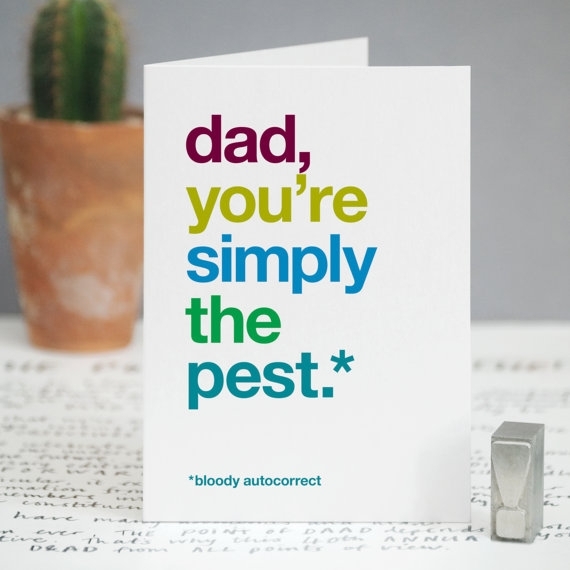 Turn that mobile inconvenience into very relatable and punny thank-you card for dad! Stepdads admittedly have a hard time in earning the affection of their wife’s children and family but it does take the right stepdad to deserve such. If you have that natural connection with your stepdad, let your respect be known by using this thank-you card. The design serves up boldness, strength, and humor. It is a known fact that strawberries symbolize grace and being thankful for your parents, specifically your father. With all the demanding schedules and responsibilities he has, he never forgets to prioritize his family. 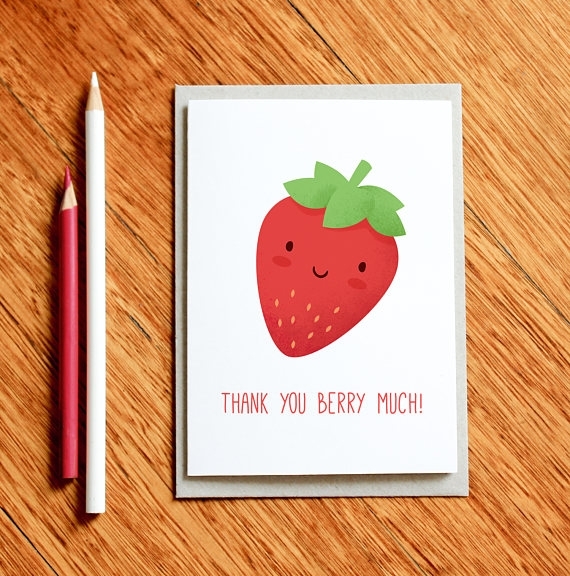 Say thanks through our berry delightful and simple illustrated strawberry thank you card with an inserted winsome pun. If you share an interest in Star Wars with your patriarch, then you may use this Yoda Best Dad Thank-You Card this Father’s Day. It is clearly evident that Yoda will be merrymaking since there is a mug of beer on his other hand. Besides giving your dad a thank you card, why not plan a get together with your dad or having some beer while enjoying a Star Wars marathon? Dad, you’re rad…dish. Get it? Well, that is how this thank-you card has been illustrated. Show your love and appreciation for your dad with this awesome thank-you card. It has a blank interior perfect for writing your heartwarming message for your dad. This thank-you card comes along with an envelope for you to give it in a presentable appearance as well as to not let the pun be known immediately. This punny thank-you card is a great take on looking up to our elders, especially our fathers and grandfathers. We aspire to be like them one day since they help us in becoming the better versions of ourselves. This is one heartwarming illustration to translate your appreciation for all great things and sacrifices your dad did for you and his family. With all the sacrifices and accomplishments your father has achieved for the family, let your love be known by showing him your support and gratitude, be it towards actions and it could also be through thank-you cards. A simple thank you could have the strongest and most positive motivating forces in your life in happy tears.